In the movie “12 Angry Men,” one juror (Henry Fonda) stands up to his colleagues in a murder case and declares his belief the accused is innocent. His stance takes considerable courage. So it was a couple of weeks ago when Hockey Alberta stood alone to declare that minor hockey’s rules and equipment were not appropriate for children. As reported in the Calgary Herald on June 13, the branch announced it was going to take steps to make the game child-centred. You can’t see me right now, but I am standing on my swivel chair (no mean feat) and applauding. Finally - finally! - someone in this country was brave enough to state what everyone else in any venture involving children has known for years. There is no sport, activity, playground, elementary school classroom, or even amusement park ride that hasn’t adapted to the rather obvious: children are smaller, less developed, and incapable of nearly all adult tasks. This is true everywhere - except in Canadian hockey. So for Hockey Alberta to take this stance is beyond brave. It’s treasonous and heretical according to some, but 100% correct. Canada’s hockey structure provides great autonomy to its branches to run their programs so long as they follow Hockey Canada rules. To digress from them requires application for an officially declared pilot project, such as what body checking was before the current rule took effect. In other words, Hockey Alberta is bravely standing among its peers and saying it will forge ahead with a pilot to use smaller playing surfaces, lighter pucks and adapted rules for children. This isn’t anything new. USA Hockey created its American Development Model (ADM) six years ago to address retention issues and fun. Both have been successfully addressed through a marvelous program, complete with top-notch videos and lesson plans that shrink the game to kid size. Yours truly worked in such a program in Montreal decades ago and the Europeans have known and practiced this for years, too. Occasionally one sees an association that takes a stab at aspects of it. Only in Canada have we subjected children to the same rink, puck, rules, nets, and conventions as the pros. And we wonder why kids are running off to play soccer where none of that exists. Why? Because soccer does it right. Soccer knows kids are kids and adults are adults. With the doors to the bandwagon now pushed open, it will be interesting to see who else in Canada is willing to join the Albertans in doing what is so obviously right for children. 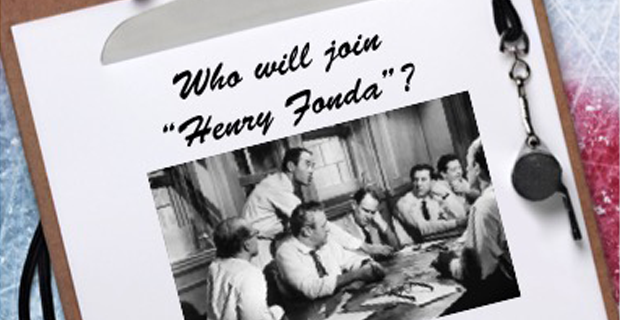 And, like Henry Fonda, will we eventually reach a point where the entire country gets on board?